As a Jabba the Hutt collector, the color of Jabba is something that I think a fair amount about (yes, it’s lots of fun at my house). 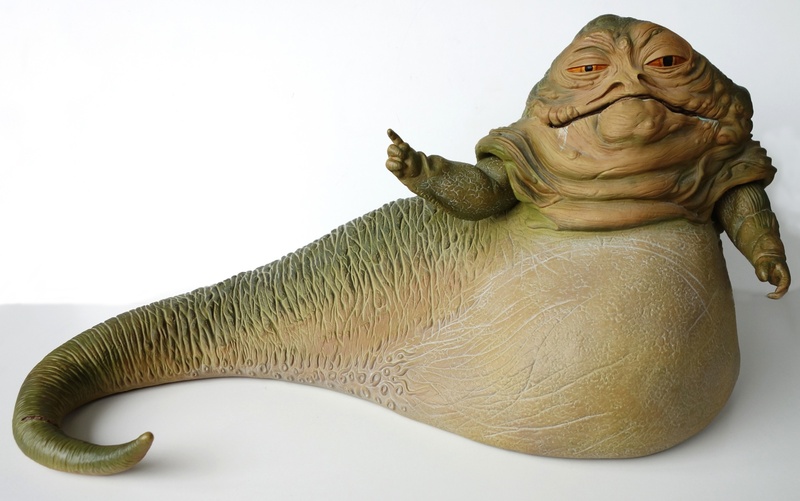 The reason is that even though the Jabba the Hutt we saw on screen in Return of the Jedi seemed to be predominantly orange, lots of toys and statues have portrayed him as green. I even went so far as to write a series of articles on this issue, if you want to know more (see part 1 here). Anyway, while the Sideshow Jabba the Hutt figure is a fantastic sculpt, I’ve always felt that they ended up giving him too green a paint job, so I wanted to repaint the figure to match what I saw on screen. Below you can see an untouched figure (it’s a separate figure — not the same one that I repainted above — but you get the point). Here he is in my full setup, including all of the related figures and “environment” pieces from Sideshow, and a few Hasbro figures to fill the gaps. (The gonk droid was scratch-built for me by someone and may not entirely fit in, but I like it so much that I keep it here. :)) Click the picture for a larger view.